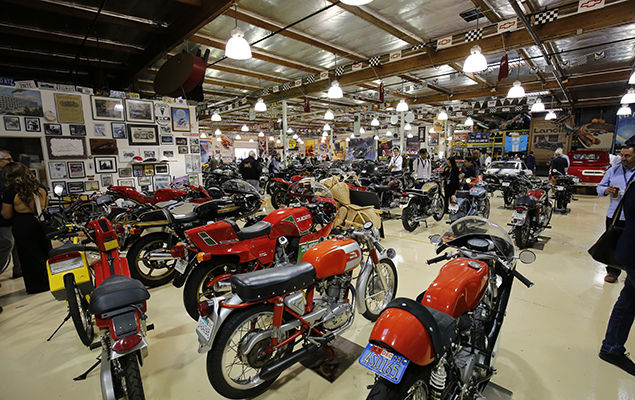 All motorcyclists have fantasies about owning a ‘Dream Garage’ – not for the building, but for what’s inside… a Ducati 916SPS, perhaps, or maybe an original ‘60s Triton and a ‘70s Yamaha XT500 trail bike? Best of all, how about all three? Some even achieve exactly that, whether through wealth, graft or cunning. 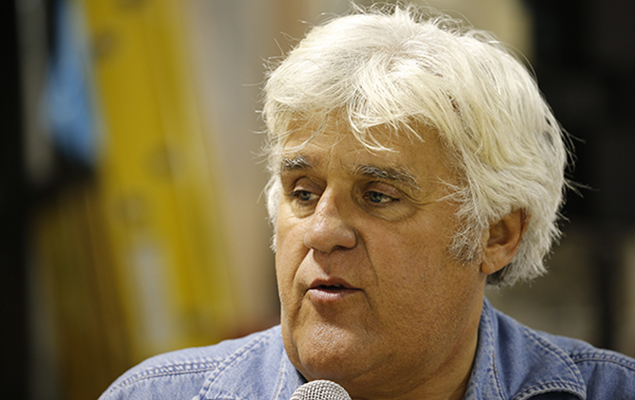 But in an otherwise non-descript industrial estate, adjacent to a small local airport on the fringes of Burbank in northern Los Angeles, is the dream garage to beat all dream garages – that of former TV host Jay Leno. In fact, the word ‘garage’ is simply too small and doesn’t remotely do the place justice. ‘Empire’, perhaps, gets close. 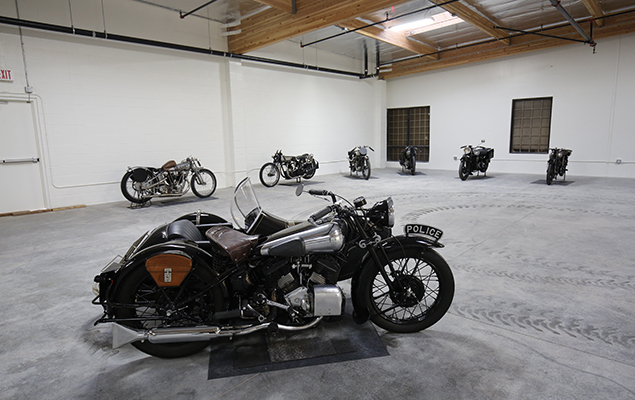 Begun by multi-millionaire petrol head Leno in 1990 and repeatedly expanded since to take in a whole complex of neighbouring buildings, the ‘garage’ is a collection of cars, motorcycles and memorabilia like no other. 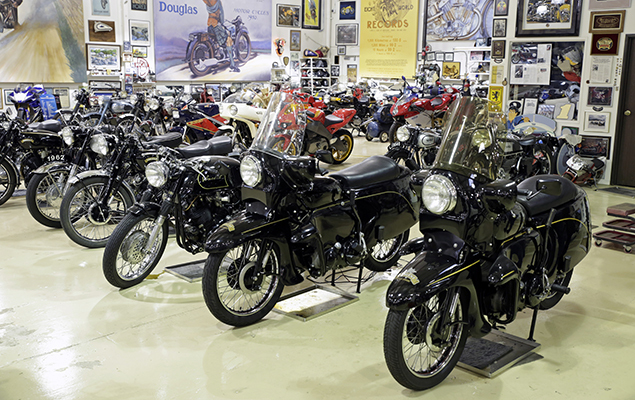 Today it comprises over 180 cars, 80 bikes, has three full time staff and is considered one of the finest collections in the US. As such, although only open to the public by special invitation, it’s now the subject of a popular TV show, has it’s own Facebook and Twitter feeds and is the envy of the car and bike world. But it’s the vehicles that are the true stars. All maintained as runners rather than museum pieces by Leno’s staff (there’s a huge, full-time workshop on-site as well) the car collection, including countless Bugattis, American muscle cars and oddballs such as the Top Gear-featured, Spitfire-engined V12 Bentley, is impressive enough. Nor are they all just exclusive, expensive classics. There’s a pair of virtually new Aprilia RSV4s, a K1600GTL, a S1000RR and a Hayabusa, all plugged in to trickle chargers, ready to go. There’s a humble Aprilia Shiver 750 and a Vespa GTS scoot to zip around town on. Or, when Leno fancies something relatively classic and Italian, there’s an 851 Duke and a mark III Le Mans. And with that he’s off again, doing a quick demo on his Y2K gas turbine bike before disappearing into the night on his beloved Brough. If you think you’ve got a dream garage you might as well give up now… But, just in case, get in touch and show us your collection!